The battle lines have been drawn and campaigning is underway as politicians, business leaders and celebrities have weighed in on whether the United Kingdom should remain in the European Union. Prime Minister David Cameron has promised that the British public will have a chance to vote on the issue in a nationwide referendum within two years, though JMU Journalism decided to test the waters early and survey people in Liverpool for their views on the contentious subject. We sent a team of nearly 70 reporters out onto the streets of the city centre to ask UK citizens if they think the country should stay in the EU or leave. As ever with our public polls, the opinions we gathered were very diverse, though the result was conclusive as among 341 people surveyed, 227 (67%) said the UK should retain its membership of the European Union, with 80 (23%) suggesting that it is time to pull out and 34 (10%) stating either that they did not know their answer or care about the matter. The number of those in favour of sticking within the EU mirrors the 67% of the UK public which voted to stay part of Europe when the question was last posed in a referendum 40 years ago. 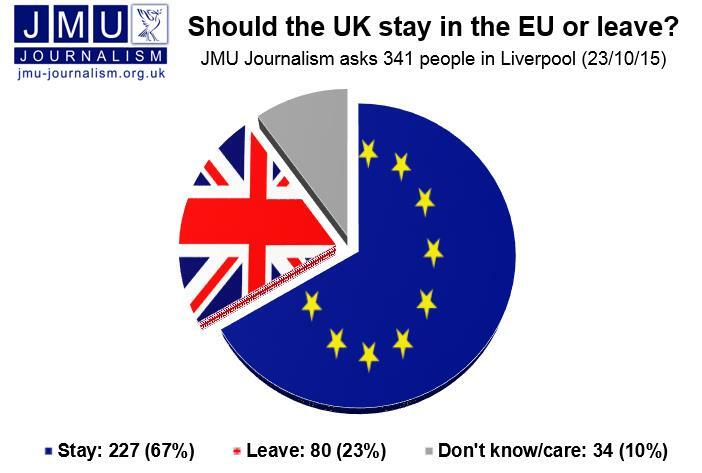 However, the majority disagreed with that verdict and Liverpool resident Paul Hartley, 52, told JMU Journalism: “We should stay. It’s beneficial to the country as a whole. It means we can continue to trade. I also think there’s other benefits in terms of security. Rob Jardine, 40, of West Derby, agreed saying: “Yes we should stay because it is better connection with other countries. 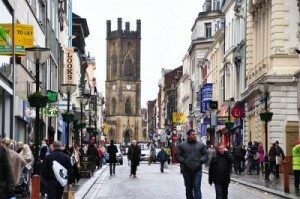 Scroll through the edited comments below to read more of the hundreds of views expressed in our exclusive street survey. Additional reporting by: Alexandra Amadeo; Anisah Arif; Edward Baldwin; Zak Bamford; Charlie Burgess; Jack Butler; Georgia Clewer; Joanne Cunliffe; Mark Daly; Matthew Davies; Marcello Dotolo; Shaun Driscoll; James Farrington; Oliver Fell; Olivia Friett; Evan Fyfe; Chloe George; Jessica Grieveson-Smith; Emily Griffiths; Samuel Hall; Shelby Hamilton; Amy Harding; Elijah Hartley-Beard; Gemma Jones; Rebecca Jones; Liam Keen; Stephanie Kettle; Gabriele Lala; Adam Leighton; Ross McAuley; Holly McEvoy; Abigail Nicholson; Sean O’Connor; Jordan Reais; Dayna Latham; Sam O’Hara; Violet Pocock; Matthew Ramirez; Marcella Rick; Louis Robinson; Lewis Rooke; Daisy Scott; Matthew Skelly; Laura Smith; Tim Spencer Tanfield; Michael Stokes; Suzy Sankey; Tom Swift; Danielle Thomas; Portia Cherish Testa; Shaniece Thompson; Joe Watson; Lucy Winter; Hannah Wilkinson; Joseph Covell; Alexandra Davies; Junaid Haque; Ross Hilton-Inkpin; Jessica Hughes; Jasper Hunt; Arkadiusz Kiciak; Emily Kinsella; Sara O’Hagan; Glen Robinson; Thomas Sutton; Emily Wall; Bronwen Jones. “I think we should leave. They do nothing for us, they make decisions about our country when they don’t live here.